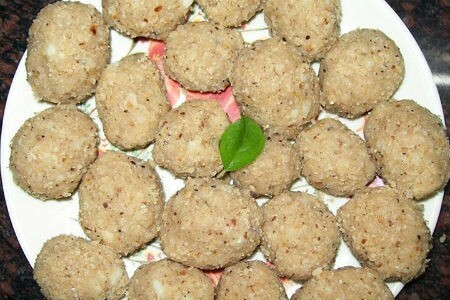 As the name suggests, this laddu is given as a prasad at Krishna temples in Dwaraka. 1. Dry roas the coconut until light golden. 2. Crumble the chapatis or cut them into small pieces. 3. Grind the coconut, peanuts, chapatis and jaggery until coarse. 4. Apply some ghee to your palms and shape the mixture into small laddus. 5. Store them in an airtight container. Feel free to comment or share your thoughts on this Dwaraka Laddu Recipe from Awesome Cuisine.